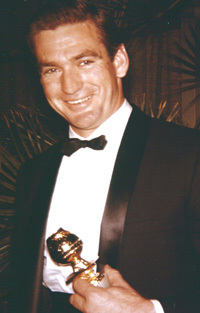 Rod Taylor's TV show, "Hong Kong," scored a prize for Television Achievement during the 18th Annual Golden Globe Awards. The awards were held March 16, 1961, at the Beverly Hilton Hotel. "Hong Kong" earned its award "for outstanding merit in the adventure field," according to the Golden Globes website. Rod Taylor was a presenter at the 20th Annual Golden Globe Awards, which were held March 5, 1963, at the Cocoanut Grove. He presented the award for Best Actress in a TV Series. The winner was Donna Reed of "The Donna Reed Show." The Golden Globe Awards are bestowed by the members of the Hollywood Foreign Press Association, recognizing excellence in film and television worldwide. The award ceremony was broadcast locally on KTTV in Los Angeles starting in 1958, then nationally in 1964.